inhibits your ability to discover what you don't know. I realized - somewhere in the midst of all the packing and moving - that I own a lot of knitting books that I've never made anything from. Nothing. Nada. Zip. Zilch. Maybe up to 20 or so of my knitting book collection. A lot. And I just packed them, moved them from Providence to Pennsylvania, gave them to movers to bring to San Diego, and unpacked them. That's a lot of work for books I - for whatever reason - never got around to using. That needs to change, but how? Clearly, I need a plan. A schedule. Call me Type-A, but I like my lists. And since I'm in the middle of planning my yearly schedule, what could be more natural than making a plan and checking my list? Here's the plan: Intern year is divided into 13 "months" of 4 weeks each. For each month, I will select and begin a project from one of the books pictured at right. These are great books. With great patterns. What have I been missing? There are 18 books, which gives me a bit of flexibility, and a wide range of projects from sweaters to baby garments to pillows. Bonus points for using stash where possible. Finishing within the month is not essential, as I have no problems with the multiple WIP reality, and this is all about trying new (but old) things. Books that I do not use will face a serious hearing as to whether they can be best served by a continued placement on my bookshelf. New books may enter the rotation, but note that they may displace older and deserving books. The Bottom Line: My own personal Knitting-Book-A-Month Club. The books just happen to be books I already own. Now, in this plan I'm not including magazines, pamphlets, or "reference" books. Reference is defined rather broadly. Kaffe Fasset's Glorious Knits, for example. While I did tag the pepulm shaped poppy jacket (eBay photo, only one I could find) late at night -- and I can't decide if it is so out there that it's incredibly wearable or if it's just out there -- this book is really not in my collection for the patterns. And magazines . . . someday I'll organize them. In the interim, watch as my sidebar explodes with new projects. Ribby Cardi? What Ribby Cardi? Great plan! New beginnings for your new beginning. Do you have a little one to knit the lady bug sweater for? It's on my list to knit for my granddaughter. i'm glad to hear you're settling in so well from your move. winter might come as a shock (does it get cold in San Diego)? I thought about doing something like that back in January! Of course I sort of failed as I seem to be using the same books. At least I haven't bought many new ones that I've been coveting for a long while. I'm sure you'll do better. oh, you Type A people and your silly plans. Actually, it sounds like a great idea - if you're that "type." i LOVE the idea! i feel so similarly about my stash of books. so many nice things to make, and yet i keep adding new books to the shelves. i'm tempted to try (read: blatantly steal) something like you are doing myself, but i'll wait a bit. i try to let these kinds of commitment projects ruminate a bit before i commit. regardless though, it's a fabulous idea, and one that will make for great blog material too! This is a great plan and one that I will follow vicariously via your blog. The Fassett design is so far out there it has fallen over the edge - DNR! Don't make that poppy jacket... way too ugly. I love a plan! Of course, I tend to completely disregard my plans once I've made them, but the important part is making them. Can't wait to see your Knitting A Book A Month progress. I'll just watch from the wings and cheer you on here. I was just looking through my HandKnit Holidays book last night and realized how many good patterns I overlooked. You definitely have a good assortment of books there. Can't wait to see what you choose. Love the idea and the freedom you're embracing with all the starteritis! :) Can't wait to see what projects you choose! I love the idea of a knitting book-of-the-month club! I might have to use the idea myself once I can locate my stash knitting books (they are somewhere in this half packed/half unpacked sublet of mine). But when I finish my current WIPs and immediate-future knits, I am inspired to look through my never-knit-from books as well. Great idea! I like your Knitting Book A Month plan. 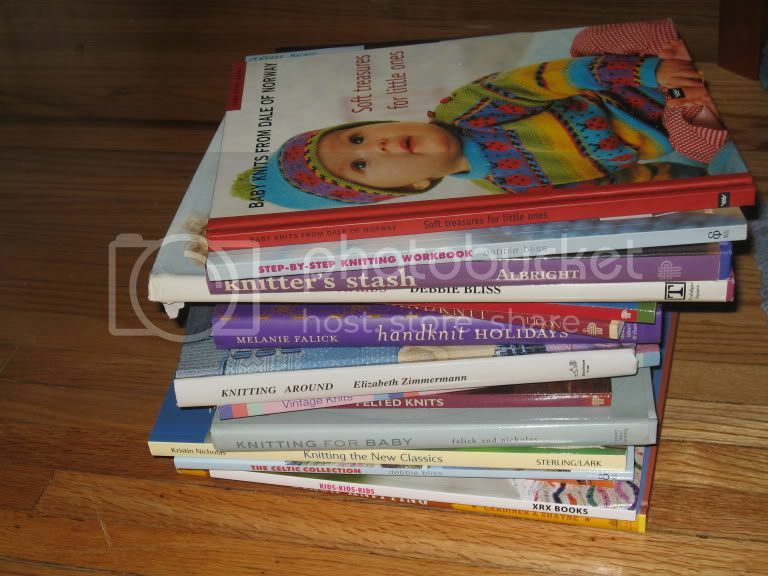 I recently discovered that I have more knitting books than B & N. Scary thought, maybe I should knit something from them. Type A? When you start highlighting your lists with different colored highlighters, then you'll be Type A, missy. Not that I would know anybody that does that. This would SO guarantee 13 WIPS for me. But it's a great idea, as out of sight out of mind occurs so easily with knitting patterns. THERE'S an idea for a new kind of wallpaper.